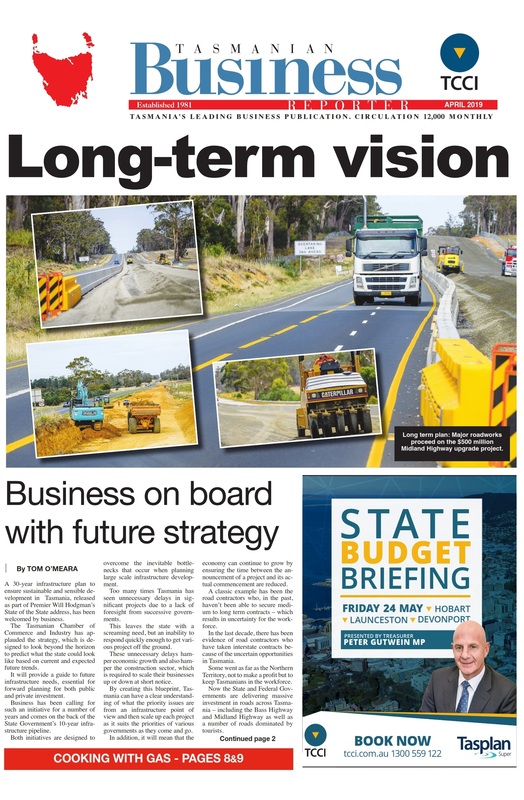 THE business community has applauded a move that is likely to see the creation of a $6.5 billion single Tasmanian super fund through the merger of industry funds Tasplan and Quadrant, which the state government’s RBF Tasmanian Accumulation Scheme is now poised to join. Tasmanian Chamber of Commerce and Industry chairwoman Susan Parr said the move was a vote of confidence in the Tasmanian economy and would create the state’s largest business by dollar value. “The creation of a fund responsible for the management of $6.5 billion in investment funds here in Tasmania will have significant benefits, not only to the many thousands of fund members, but also for the broader community,” Ms Parr said. “By locating the fund in Tasmania, we ensure that the state can generate a centre for excellence in financial services delivery through the employment of people involved in the management of the fund. Tasplan chairwoman Naomi Edwards welcomed the move, saying if successful, the three merged funds would have about 165,000 members and deliver significant economies of scale and value for money for its members. Tasplan and Quadrant CEO Wayne Davy predicted a positive future for super in Tasmania. “The RBF Tasmanian Accumulation Scheme merger is a huge step for Tasplan and for the state,” Mr Davy said. Treasurer Peter Gutwein said the move was triggered by a state government review of public sector super fund, the RBF, which identified that due to declining members and a lack of scale in terms of funds under management, costs would rise over time and make the RBF uncompetitive. “As a result it was recommended to the government that we should exit the role of providing superannuation through the RBF and that consideration should be given to seeking a merger partner that, in all likelihood, would see the assets and management of the fund be transferred to a mainland-based superannuation fund,” Mr Gutwein said. “The decision to take this course of action, in the government’s view, needed to be weighed against the risk that the other major Tasmanian superannuation fund providers, Tasplan and Quadrant [who have agreed to merge separate to this process], would also in time come under similar pressures. “This would mean that potentially over time Tasmania would not have a major locally based superannuation fund in the state and jobs and expertise would be lost to the mainland. “In the government’s view, this would not be in the state’s best interests. ‘‘Therefore I asked the RBF to hold discussions with Tasplan and Quadrant – to consider and develop a business case on the feasibility of a single Tasmanian superannuation fund. “That business case concluded that a merger would be in the best interests of their respective memberships, and the government has today entered into a memorandum of understanding with RBF, Tasplan and Quadrant to go through a process of due diligence under the standard national rules, and subject to it being in the best interests of members, create a single Tasmanian superannuation fund,” Mr Gutwein said. Subject to due diligence, confirmation by the respective boards and enactment of enabling legislation, it is anticipated that the merged entity will be created by the end of 2016. The RBF’s Defined Benefit Schemes will continue to be the ongoing responsibility of government and will continue to be administered under an outsourced model with a new tender for the service to start at the completion of the current contract.